Our high quality industrial adhesives are an effective and cost-efficient alternative to many machanical connections. Providing solutions for various applications, industrial adhesives have been on the rise for years. Due to our long-standing experience, we are the ideal contact for your specific purposes. If you like to learn more about our product range, please see our catalogue. 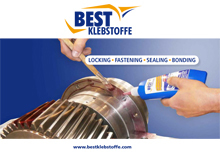 BEST offers an excellent price-performance-ratio due to our in-house production in KInsau – Industrial adhesives Made in Germany. By specializing in industry, trade and commerce, we can ensure optimal quality of our products.Convince yourself – order a free sample or get in touch with us.